Just in the Nick of Time Giveaway! $250 PayPal Cash! Are you done with your Christmas shopping yet? I was hoping to be done with most of it this weekend, unfortunately that did not happen. Somehow, I had the ability to have cash in hand, go to the stores, and not be able to find anything that was on my list. While I love to be able to be done with most everything early, I am always a last minute girl too, running out trying to finish up a few things at the very last minute. If you have that tendency, or perhaps you don’t, I am offering a great giveaway right now for $250 PayPal cash! It will be sent on December 23rd, hence, Just in the Nick of Time! To enter, just scroll all the way down and use the handy rafflecopter form! Good luck! 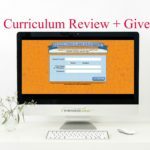 Back to School $250 giveaway! 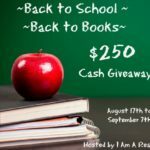 Back to the Books $250 Cash Giveaway! Previous Post: « What if we change the conversation? Awesome giveaway right before the holidays!